This shows the person or company responsible for sending the article to the Assay Office. The sponsor may be the manufacturer, retailer, importer, for example. The background shape shows the metal (gold). The figure shows the article consists of 750 parts of gold by weight to 250 parts of other metals – 75% gold. This is equal to 18 carats (18 parts in every 24), the traditional way of describing gold purity. In addition to the Compulsory Marks a sponsor may wish to incorporate any of the traditional marks which have been struck on British articles over the centuries and which have been recognised throughout the world. This will tell you in which year the article was tested and marked. Special Marks to commemorate significant national events may also be added if a sponsor chooses. The Millennium Mark to celebrate the year 2000 was very popular and was applied to over 5 million articles of jewellery and silverware. The most recent commemorative mark is to honour the Queens Jubilee in 2012. 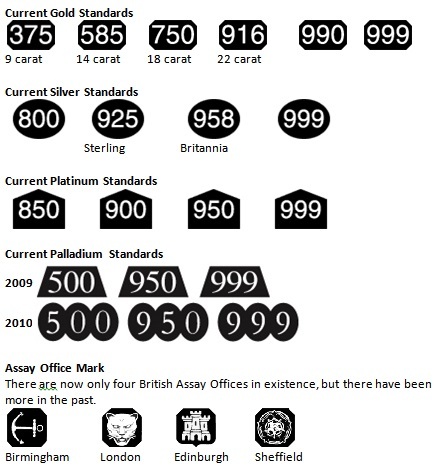 Other marks have been used historically for example, the Duty Mark and classic marks such as the figure of Britannia to signify Britannia Silver.